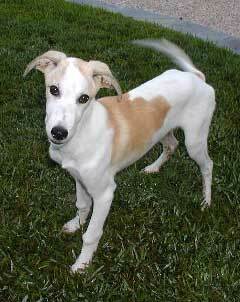 Roy is a handsome white with red fawn patches almost 5-month-old male greyhound, born May 2003. 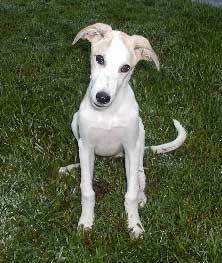 Roy, along with Rob, was part of a litter of 7 greyhound puppies that were dumped into a creek in the Waco area. Their rescuer saw what had happened and immediately fished the 7 greys out of the stream. The seven were in very bad shape, two with deformed dew claws - Rob and Roy. This is easily remedied with surgery and will not impede them at all! Their surgery is scheduled soon. Rob and Roy are both together in a "puppy foster home," one that GALT considers to be very blessed to have. Their foster parents, Allie and Dave, will be giving us updates periodically on their progress. Our mission right now is to put some weight on these boys! Roy is very outgoing and affectionate. 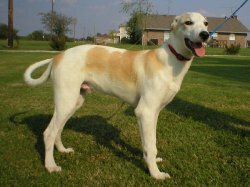 He's very playful, and not fearful of other dogs or people. He's got typical puppy energy and will play for hours. He will need some interactive obedience with walking on a leash (he currently likes to jump up and down when on a leash) along with basic obedience. This is recommended for all puppies to help develop them into the best dog they can be. He will bring hours of entertainment to the person who's willing to make the commitment for Roy to be part of their family.